Lately, you have been getting below average sales. You know that there’s something wrong with the overall website, but you can’t put a finger on it. You try out a few CRO tactics here and there, but the results are not significant at all. To resolve this, you are planning to redesign the website. Are you sure that the redesign will solve this problem? You see, CRO is a complex process that requires perpetual refinement. Before you go all in and redesign the website, we urge you to read the following article just to make sure that you are not committing any of the following CRO faux pas. The foundation of any business, product or service begins by understanding your customers. Many businesses completely disregard this step and move on to the product development and marketing. This turns out to be a dire mistake as every strategy or tactic implemented is uninformed and will most likely fail. The only solution to this is to internalize the “Know thy customer” mantra. Start with researching their interests, preferences and based on your research, design the buyer personas. What do your buyers do? Are they tech savvy? When you know your buyers to their bare bones, you will be able to design the store, craft your messaging accordingly. In the pursuit of generating sales quickly, e-commerce store owners implement CRO tactics that are rooted in opinions rather than facts. They might implement a hack or tactic they read in an article or try changing the color of the CTA just because their competitor did. But hacks or tips can only take you so far. What you need to realize is that CRO is a process, a journey. It’s an iterative process which is driven by experiments. Sure, feel free to try random hacks, but make sure that they fit in the larger framework of your CRO process. Your goal should be to establish a CRO process where try out new things, measure their performance and optimize them further to better the result. Before making a purchase, your visitors do a thorough research to make sure that the store they’re purchasing from is trustworthy. 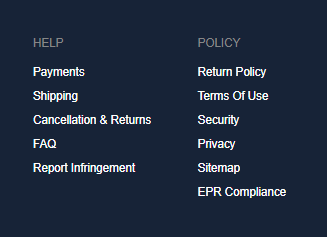 Make it easy for your customers to find your shipping, returns and cancellation policies. 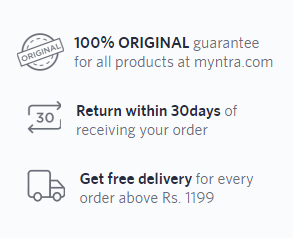 Flipkart has dedicated 2 sections in their footer mentioning links to their policies and compliances. Trust indicators such as security badges and seals inspire confidence within your visitors that their details are safe and you don’t sell counterfeit products. When starting out with CRO, it’s a classic rookie mistake to try out multiple things simultaneously. You might try changing the color of the CTA button, fiddle with its placement, change the navigation all at once. In addition to this, you might also add email list builders, pop-ups, header bars etc. Doing these activities haphazardly will result in a trainwreck. To truly get the best results, you need to try A/B testing where you change only one variable at a time to see its result and keep moving forward until the desired results are achieved. Whenever you want to try multiple things, a thumb rule to remember is that if you find it is disrupting the overall user experience, it probably is. If you are running CRO activities already, kudos to you! But if you are not regularly reviewing analytics data then it could prove to be fatal for your CRO plan. If you are conducting an A/B test, you need to ensure that you are getting the desired results otherwise you can make the necessary changes. To do this, check the results in your analytics tool regularly. You can look for the traffic, its sources, their demographic and geographic characteristics etc. Doing this will also help you understand whether your activities are reaching to the intended audience. Note: One thing you need to be wary of is bot traffic. Bot traffic can completely ruin your activities if you do not handle them well. You can track them based on the referral source, IP address or specific locations. You can instruct the analytics software to block the tracking of such dimensions and metrics to get the proper view of your data. Your store visitors will inadvertently leave your website. They were shopping on your website during work hours but had to abandon the cart since some urgent work came in. The reasons could be plenty. If you are not re-engaging them, then you are missing out on a big chunk of users who would buy from you just by a simple nudge. These pop-ups keep understanding the user behavior and display a pop-up when the user is about to leave the website. You can use discounts or coupon codes to incite the visitor to complete the process. If the user had put items in their cart but didn’t complete the checkout process then you can drop them an email asking them to complete the purchase. In case they’d forgotten about it, they’ll most likely complete the purchase. Remarketing (Also known as retargeting) works on cookie technology to personalize the user experience. If you’ve browsed the Amazon website, you most likely have seen an ad of the product you saw in your social feed. That’s remarketing in action. Retargeting complements the cart abandonment emails effectively by reaching your visitors through social media and other websites. If you’ve been running or marketing an e-commerce store, you must have realized that managing it is not a walk in the park. You might be committing these errors unconsciously but since you are aware of them, you can now fix them. CRO process is not easy. It is a gradual effort that takes time to get the ball rolling but don’t let that deter you from applying it. By correcting these errors, you will be able to see improvement in the conversion rate in a relatively short time. What CRO mistakes did you make when starting out?